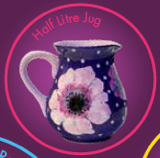 Location: Mambo Jambos Pottery Painting Studio, Squire’s Garden Centre, Badshot Lea Road, Farnham, GU9 9JX. Have you always wanted to have a go at pottery painting but thought that you weren’t artistic enough? Mambo Jambos is launching new weekly pottery painting technique classes for adults at their studio opposite Squire’s Garden Centre in Badshot Lea, Farnham, GU9 9JX. These fun classes are held on Wednesdays and Fridays in February and March at 10am-12pm, and are sure to bring out the inner artist in you! You’ll get step-by-step instruction, which will enable you to create a stunning pottery piece. There’s a different theme each week, such as paint blowing onto a vase, using mandala dotting designs on a spoon rest, printing and paper painting designs on a jug, and using water painting and design transfers on a fruit bowl. Tickets are £25 per class and include all materials, tuition, your decorated pottery piece, plus coffee and cake. Your pottery piece will then be fired in the kiln, ready to collect two weeks after your class. Places are limited so book online now at www.squiresgardencentres.co.uk. Use paper cut out designs to create a small and medium sushi wavy plate. 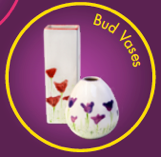 Learn paint blowing techniques to decorate a round and square Bud Vase. Use Mandala dotting designs to create a useful Spoon Rest. Learn printing and paper painting techniques to design a Half Litre Jug. Fri 22nd Mar 10am Fruit Bowl Use design transfers and water painting techniques to create your very own Fruit Bowl.